"A Cultural Jewel in the City"
The story of Huntington "Skip" Sheldon's devotion to sailboat racing has all the makings of an Ernest Hemingway novel, complete with the challenge of outdoor adventure as a metaphor for the struggle against both internal and external forces of nature. 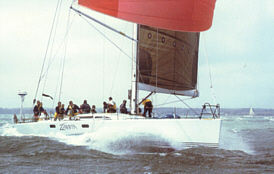 On June 14, Sheldon (pictured at left) and a 12-person crew will race a 65-foot sailboat across the Atlantic. The 3,600-mile DaimlerChrysler North Atlantic Challenge 2003 is sure to be an intense experience that will test the limits of all involved -- and that challenge, Sheldon says, is exactly what appeals to him. The 32 yachts competing in the regatta will start in Newport, Rhode Island, before heading north of the British Isles and ending on the river Elbe, in Hamburg, Germany. The race is expected to take between two and three weeks, depending on wind and weather conditions. For Sheldon, sailing is a high-level art form. "Many people are prepared to work hard for an hour or two, but most people don't want to expose themselves to Mother Nature in perilous circumstances, or exert themselves for extended periods of time in high-risk undertakings," he says, adding, "Most people like to sleep in their own beds." Sheldon will captain "Zaraffa" and crew. Unlike recreational boating, ocean racing is something "that can engage you at the limit of your character and abilities," says Sheldon, who enjoyed a long career as a cell biologist and pathologist, teaching at Hopkins, Harvard and McGill universities, before retiring in 1990. "It's one of the great adventures of the world and completely challenging and absorbing." Another plus: "As long as you're out at sea, you don't have to pay the bills or answer the phone," he jokes. Sheldon, the owner of Zaraffa, is captain, doctor, cook, and part-time navigator and steersman for the crew, six of whom have already sailed around the world. They have reason for some measure of confidence, since Zaraffa has previously won the Newport Bermuda Race and the Northern Ocean Racing championship in 2002. To train, the crew spends nights out at sea together. "It's important that the crew is experienced and confident working together," says Sheldon. "There's always risk -- a mast could break, the boat could fill with water, or someone could get hurt or fall overboard. You have to balance risk and safety, and you have to be able to trust your team. In the right company, everyone gets lifted up by the teamwork and enthusiasm." Sheldon learned to sail as a teenager. During a break from medical school at Hopkins, he took a crew of several fellow students sailing in "an old, leaky schooner" from Montauk Point, Long Island, to the Bahamas, where they spent two months in the Caribbean. "I probably should have been studying," he says, "but instead I got to sail, visit islands, and see whales. It was an exceptionally good adventure. "Sailing is one of those sports you can participate in your whole life because it's not completely dependent on being in peak physical condition," says Sheldon, a trustee of Johns Hopkins Medicine and trustee emeritus of the university. "Experience counts, and there's an art to the sport that permeates everything, from how you build the boat to how you choose and train the crew. Especially in a long race, the tempo and the management of human resources are the most important elements." Success depends on more than luck, but serendipity and the alignment of circumstances that pass for luck are always factors. "And if you happen to be lucky enough to win, it's a tremendous high," says Sheldon. Randolph Bromery, A&S '68 (PhD), was appointed in February to serve on the President's Committee on the National Medal of Science. Administered by the National Science Foundation, the award is the nation's highest scientific honor. Bromery holds eight honorary degrees that reflect his distinguished career in higher education and government service, including a recent honorary degree from Johns Hopkins. He is the Commonwealth Professor Emeritus of Geophysics at the University of Massachusetts and has served as the chancellor of the University of Massachusetts, president of Springfield College, Westfield State College, and Roxbury Community College, and chancellor of the Board of Regents for Higher Education in the Commonwealth of Massachusetts. "Having been in higher education administration for so long, it's nice to know that people haven't forgotten that I'm a scientist at heart," said Bromery of his presidential appointment. "As a research scientist, I've found that learning to manage research can actually be helpful in learning how to manage people." You never know where your Johns Hopkins education will take you. For Robert Singer, A&S '72 (pictured at left), the journey has taken a fashionable twist. Singer set out to be a professor of literature, but today he is the chief financial officer and executive vice president for Gucci in Milan, Italy. After Gucci hired him in 1995, Singer helped shepherd its initial public offering, and it now trades on the New York and Amsterdam stock exchanges. The company, Singer says, is a successful blend of American management style and Italian creativity. Over the past two years, with Singer guiding the finances, Gucci successfully fought a hostile takeover from competitor Louis Vuitton Moet Hennessey. What is a Book?, by David Kirby, A&S '69 (PhD), University of Georgia Press (2002). English professor, poet, and critic Kirby steps about in these essays but mostly focuses on the consequences of a 1966 Johns Hopkins symposium that "changed permanently the reading, teaching and writing of literature in the United States." He's unhappy with much of the results, aiming his cannon, and his own canon, at the radical literary left's deconstructivist cannonading. Confederate Industry: Manufacturers and Quartermasters in the Civil War, by Harold S. Wilson, A&S '59, University Press of Mississippi (2002). This student of C. Vann Woodward takes measure of the Confederacy through its own accounts -- yards and cards of cotton and wool, sides of bacon. Laymen could be daunted, but buffs will find insights that have been slighted by more military histories. Kent Island: The Land That Once Was Eden by Janet Freedman, A&S '99 (MA), Maryland Historical Society (2002). A sensuous evocation of Maryland's Eastern Shore, just across the Chesapeake Bay but oceans away, rebuts the belief that modernization signifies progress. A Nicaraguan farmer who had lived in a mud shack his whole life was recently able to build a house and give property to his son, who also built a house. The father and son duo also helped construct a sewage drainage system for the benefit of their community. Such increased prosperity in the face of utter poverty is due, in part, to the work of people like Jim Orr, SAIS '74 (pictured at left). As head of his own international consulting firm, Orr usually rubs shoulders with the power brokers who maneuver within the heady world of Washington, DC: prominent politicians, CEOs, and officials of the World Bank and International Monetary Fund. But through his work with a non-profit organization called TechnoServe, Orr can also be found giving advice to entrepreneurial Nicaraguan farmers, or helping workers at a cashew processing plant in Mozambique to craft a business plan. TechnoServe's mission is to help enterprising people in the developing world build businesses. Orr says he helps aspiring entrepreneurs overcome such obstacles as lack of "money, backing, loan collateral, access to markets, and even basic business skills." He works to set up the right financial connections and advises on smart business strategies, sometimes meeting face-to-face with TechnoServe clients and staff on location in places like Nicaragua. Business advice from Jim Orr has helped improve the lives of Nicaraguan coffee growers (at left) and farmers like Benjamin Castro (below right). Photo below by Wilfredo Chavarria In addition to running James Orr Associates, he's the executive director of the Bretton Woods Committee, an elite group of about 700 corporate chief executives, former cabinet officials, and other prominent Americans, including past United States presidents, that is dedicated to promoting public understanding of global financial and development issues. He says he calls upon the expertise he developed while working on Capitol Hill as the counsel for international affairs for the International Trade and Development Subcommittee, noting, "That's when I got to know how Congress and funding agencies work." Working with TechnoServe, he has helped coffee growers in Costa Rica, Nicaragua, and Honduras switch from growing overly abundant generic coffee to growing high-quality specialty coffee that can be branded and marketed as a cut above commonplace brews. 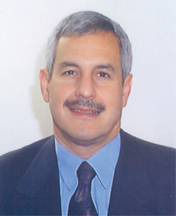 He pressed the Inter-American Development Bank in Washington for the grant that financed the operation and then met with the head of the large coffee growers association in Nicaragua in a successful effort to persuade the association to join forces with small farmers. He even helped arrange a taste testing. As a result, he says, "the coffee has now been very well received by international buyers and all the available crop has been purchased." Another group of Nicaraguan farmers was persuaded to abandon subsistence crops to grow up-scale vegetables like broccoli, carrots, lettuce, and cabbage for cash sales to a national supermarket chain. "I helped make contact with the right executives of the Nicaraguan supermarket chain, and others at TechnoServe helped the small farmers to negotiate their contract," says Orr. "Now, supermarket trucks stop at the farmers' doors twice a week to pick up the beautiful fresh produce. Incomes of some of the farmers have increased ten-fold." TechnoServe also provided two enterprising farmers with the drip irrigation equipment and the know-how to produce and market organic onions. "Now all the farmers in the valley are moving to organics," says Orr. "Some output has been exported to U.S. supermarkets on the East Coast, and exports are expected to grow rapidly." When Terrance Patterson, Peab '89, reflects on his own introduction to classical music, he worries about its future. "When I was 12, I was just flipping the radio stations, and I landed on our local NPR classical music station," Patterson recalls. "That was it; I was hooked." 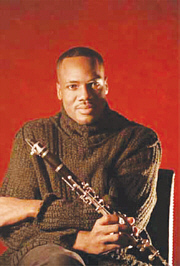 Today, as music education programs struggle for funding, and radio stations increasingly shift to all-talk formats, the Peabody-trained clarinetist fears that young people, especially African Americans, won't receive the early exposure to classical music that he did. "By the time I was accepted at Peabody, and they sent me a list of music to be familiar with, I looked at that page and I knew all [the works] -- just from listening to NPR," Patterson says. "[Radio] was an educational tool, but I don't know where the community can turn now. It just makes our job that much more important." Patterson has launched the first all-black chamber ensemble concert series in the U.S.
Photo by Natalie McCray Patterson is artistic director of the Ritz Chamber Players, the first all-black chamber ensemble in the United States. Through the chamber ensemble, Patterson brings classical music to members of the African-American community and others while also promoting the music of contemporary African-American composers. The ensemble, now in its second season, has performed works by such African-American composers as Hal Johnson, Margaret Bonds, Florence Price, Lena McLin, T.J. Anderson, William Grant Still, and Coleridge-Taylor Perkinson. The ensemble, which performs several times a year in Jacksonville, Florida, at the Times-Union Center for the Performing Arts, is comprised of musicians who are full-time members of other orchestras from around the world. Recently, the group has expanded its performance area to include the University of Florida in Gainesville ("We are discussing a 'residency' there," says Patterson), Fort Lauderdale, and Atlanta. "We're really trying to change the idea of what new music, and classical music in general, is all about," Patterson says. Whether performing for audiences young or old, the Players engage their listeners, talking before each piece about the composer's technique, and what the audience might listen for. While full orchestras can be intimidating, Patterson says, chamber music -- generally performed by fewer than 10 musicians -- can provide a more intimate and accessible introduction to classical music. Currently, just 1.5 percent of professional classical musicians in the U.S. are African American, according to the American Symphony Orchestra League. So an all-black classical ensemble can seem like "a novelty at first," Patterson says. "But the audience soon realizes it's an incredible group of musicians." Says Ritz soprano Alison Buchanan, "I feel like I am part of history in the making, and I'm awed by that." Patterson has arranged for the Players to have a "resident" African-American composer. Currently, it's Alvin Singleton, a Fulbright Scholar who has worked with the Atlanta and Detroit symphonies. The ensemble performs at least one example of his work at each concert. The opportunity to learn and perform original pieces of music adds an exciting -- if sometimes nerve-racking -- dynamic, says Patterson: "We fly in maybe four days before the concert, and we rehearse extensively because the composer is coming. Beethoven may be dead, but Singleton is coming tomorrow!" The Ritz Chamber Players have made a significant impact in Jacksonville, according to William Brown, distinguished professor of music at Jacksonville's University of North Florida. Peabody's Path to Pre-eminence: "A Cultural Jewel in the City"
Peabody Institute campaign chair Turner B. Smith, president of the South Charles Investment Corporation, and vice-chair Anthony Deering, president and CEO of The Rouse Company, talk with Jeanne Johnson about what connects them to Peabody and what the future holds for the prestigious conservatory. 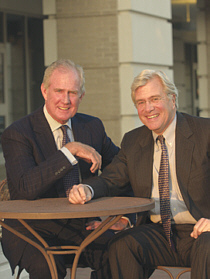 Deering (left) and Smith How did you become involved in the campaign for Peabody? TS: I was attracted by the opportunity to get involved with students and help with scholarships. Also, I play some classical guitar and really appreciate music and the power of music. So of course I appreciate Peabody. Tony got me involved and we're old friends, so it was a natural connection. Do you play an instrument, Mr. Deering? AD: Let's just say that I appreciate what Turner does. And he's being too modest, by the way -- he's really quite an accomplished classical guitarist. But I've attended some wonderful concerts at Peabody, and I've always been interested in Peabody, so when the opportunity presented itself, I embraced it. What do you envision for Peabody's future? AD: Peabody is such a wonderful place. It's a cultural jewel in the city that should shine brighter than it has in the past. Architecturally, the campus will be opened up to be more welcoming, more human-scaled. Previously, the beauty of the architecture tended to get lost in a maze of buildings. In the past, you could go by Mount Vernon and not even know that it was the location of America's oldest music conservatory. Now, I think Peabody will have a distinct presence. TS: It's amazing how far Peabody has come, from being on the brink of extinction to being one of the top schools in the country. Peabody has really flourished under the Hopkins umbrella. I am repeatedly impressed by how professional, accomplished, and committed the professors and students are at Peabody. We need to nurture all of that and make it even better. AD: I would like to see Peabody gain even wider recognition for the remarkable institution that it is. 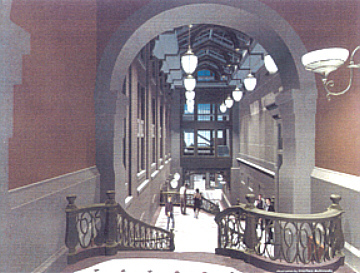 An artist's rendering of the new Peabody arcade. What has to happen for you to realize your vision? TS: We've already begun with the first phase, which involves rehabilitating the buildings so that Peabody will really be something to look at. The second phase will focus on endowment, salaries, and programmatic support. The support we've received so far from companies like Rouse, T. Rowe Price and Alex. Brown is really a testament to the work of Mr. Deering. What do you say to prospective donors? AD: These are trying times, there's no doubt about it. We're definitely grappling with challenges and it's a tough matrix in which to work. But it helps that people have seen Hopkins do such great things through past campaigns, so they're confident that this campaign can also accomplish great things. TS: Peabody is an indisputably good cause. It's really that simple. In "the fog of war," reliable communication is critical. That's one reason why Army Captain Ryan Hughes' job is so vital. Hughes, Engr '99, is the assistant operations officer for the communications battalion that supports the 101st Airborne Division, which played a major role in the air and ground war in Iraq. He works in the tactical operations center to monitor the division's communications network. "Our unit is like the AT&T and ISP [Internet Service Provider] for our division of 20,000 soldiers," Hughes e-mailed from the front. Known as the "Screaming Eagles," the 101st Airborne has the ability to conduct air assault operations and long-range helicopter assaults. The division includes three brigades plus two aviation brigades, an artillery unit, and several supporting units. Hughes is one of what could be as many as 40 Hopkins ROTC graduates who were involved in the wars in Iraq and Afghanistan, says Hopkins professor of military science, Lt. Col. Charles Roller, SPSBE '01. Hughes at Camp New Jersey, just southeast of the Iraq-Kuwait border. In April, Hughes' unit deployed from Kuwait and headed into Iraq. At the time, "a common thread of conversation is trying to determine if this war is popular with the American people," he wrote. "We see reports of protests on the news and we wonder if this is a vocal minority or something more." Hughes said that he and his fellow soldiers did not expect it to be comfortable or easy, and they were right. "Showers are scarce, laundry is done by hand, and hot meals are a luxury. It is only April, but inside tents temperatures are well over 110 degrees. But complaints are few and far between because we are all in it together." This is Hughes' third deployment in the last three years. He was also with the 101st in Kosovo in 2001 and in Afghanistan in 2002. Hughes was accepted into MBA programs at American University and George Washington University and was planning to start in the fall. This June, he was also planning to be married to another Hopkins graduate, Joy Winter, SAIS '01. The war put all that on hold. When the Johns Hopkins lacrosse team hammered Maryland, 10-4, in the spring of 1950, the Blue Jays completed an unprecedented four-year, 29-game streak in which they never lost a college game. While that record is legendary, the bond that has been maintained among those players is equally astounding. For more than half a century, the 25 members of the 1950 team have reunited each June to replenish the friendships that have become the most remarkable of their lives. Many of the players from that team have connections that transcend Hopkins lacrosse. Lloyd Bunting (#75) and Tommy Gough (#62) have been brothers-in-law since 1950, when Bunting married Gough's younger sister. Bobby Sandell (#44) and Jim Adams (#50) had played lacrosse together since the second grade. 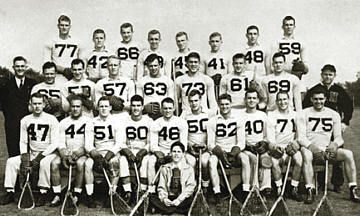 "[Many of us] were bitter enemies in high school," says Wilson Fewster (#60), who had played at Baltimore Polytechnic Institute. "But people whom I hated in high school became good friends within [the first] days of our freshman year." Members of the legendary 1950 men's lacrosse team reunite each June to replenish their friendships. The Class of '50 had an immediate impact in 1947: eight classmates started and five of them -- Fewster, Bunting, Gough, Sandell, and Fred Smith (#51) -- were among 12 Blue Jays who were named to the All-America team as Hopkins won its first national title in six years. Combined with some returning veterans -- including Brooke Tunstall, Engr '48, and Ray Greene, A&S '48 -- the team was loaded with talent. "We had some of our best games in practice," says Bunting, recalling the competitive battles for playing time. By 1950, after three consecutive national titles, that nucleus had evolved into the greatest class Johns Hopkins lacrosse had ever produced. "For me to be playing with these guys, who were heroes, was the thrill of a lifetime," says Bob Scott (#43), A&S '52, one of the few sophomores on the 1950 team. The team attracted huge crowds to Homewood Field: "They used to line three and four deep around Homewood Field," recalls Bill Tanton, A&S '53, senior associate editor at Lacrosse Magazine. "If you were a lacrosse fan, you had to go see Hopkins play." The team was so good that it could have coached itself. In some cases, it did. Kelso Morrill, a Hopkins math professor who had coached the Blue Jays from 1935 to 1946, returned to the sidelines in Spring 1950 after coach Howdy Myers, the architect of Hopkins' success, went to Hofstra. "[Dr. Morrill] came back with a lot of pressure on him," Fewster says. Those expectations may have contributed to a pesky illness that Morrill battled all season. "I think the strain of the streak got to him before it got to us," says Adams, midfielder and co-captain of the 1950 team. "So we were playing hard for him, too." When Morrill's health kept him from practice, the seniors simply ran the practices themselves. Not surprisingly, several members of the 1950 team went on to successful coaching careers. "We all loved lacrosse, and [going undefeated at Hopkins] was a high-water mark for a lot of us at that time of our lives," says Adams, who went on to coach at West Point, Penn, and Virginia. Although many of the players remained in the Maryland area after graduation, even those who have moved away make every effort to attend the annual reunion. "My wife says the stories get better and better each year," chuckles Neil Pohlhaus (#42). "I guess we tend to embellish a little." For the most up-to-date event listings, visit www.alumni.jhu.edu. Baltimore Sun India Lowres, A&S '76, has been promoted to director of alumni programs, a new position created to better serve Johns Hopkins alumni. Lowres will assist Fritz Schroeder, the executive director for annual, regional, and alumni programs, and provide day-to-day direction and management in the alumni office. "Through her years in the admissions office and the alumni office, India brings a wealth of talent and understanding to this new position," says Schroeder. "She will assume a leadership role as we continue to find new ways to enhance alumni activities and to strengthen the university through alumni involvement." Lowres has worked in admissions and alumni relations at Johns Hopkins since 1976, most recently as senior associate director in the alumni office, where she managed the 150-member Alumni Council and served as the department's liaison to the eight divisional alumni offices. "Every day, I am motivated and invigorated by the Hopkins leadership, staff members, and most importantly, the alumni," she says. "I worked with India for 21 years and always found her to be the consummate administrator," says Jerry Schnydman, executive assistant to President William R. Brody and former executive director of alumni relations. "On top of that, India is a loyal Johns Hopkins alumna who is devoted to the University and has tremendous affection for Hopkins and its alumni." Linda Tarr-Whelan, Nurs '69, is well known for her leadership on progressive policy and women's equality. 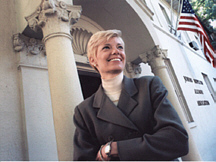 As the U.S. ambassador and representative to the U.N. Commission on the Status of Women (CSW), Tarr-Whelan led international negotiations for the U.S. on women and globalization, development, entrepreneurship, economic and political participation, and human rights. Edward A. Halle, A&S '43, has been an exemplary advocate for Johns Hopkins Medicine for over three decades. In 1971 he joined Hopkins Hospital as administrator of the outpatient department, rising to become vice president of administration for the Hospital and Health System. Now retired, he has also served as trustee on several Health System boards. Edward L. Polochick, Peab '78, is Peabody's director of choral activities and associate conductor of the Peabody Orchestra. He is founder and artistic director of Concert Artists of Baltimore and has served as director of the Baltimore Symphony Chorus. The recipient of several prestigious awards, he is also music director of the Lincoln (Neb.) Symphony Orchestra. Last October, a group of Johns Hopkins alumni braved the arctic elements of Churchill, Canada to observe polar bears in their natural habitat. "One came up to our tundra buggy and sniffed the soles of our boots from beneath the observation deck," reported Gaylord Clark, A&S '53, Med '63.